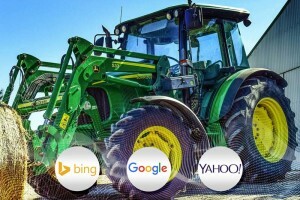 You want your farm equipment company found in Google, Yahoo and Bing. Our many years of combined experience providing digital marketing services to dealers at Russell’s Group in the agriculture and farming industry have allowed us to become industry leading experts at Search Engine Optimization (SEO) for Farm Equipment and Agriculture Equipment Dealers. That’s why you found this page highly ranked in search…we designed it to be. Just like we can do for your site. As the target audience of farm and agriculture equipment manufacturers, dealers, and distributors move online, more and more of these companies are beginning to understand the importance of online visibility and its role in their overall digital marketing efforts. It is for this reason that SEO has grown to become an indispensable aspect of any digital marketing strategy. At Russell’s Group, we use a proven proprietary SEO Audit and Competitive Analysis system to gather insights on your customers in the farm equipment and agriculture equipment industry. In turn, this gives us a good picture of the kind of targeted content your prospects want. This analysis also allows us to distribute content assets efficiently so your target audience can find it on Google, Bing, or Yahoo. We do all this with specific goals in mind: to drive targeted traffic to your website, generate leads, and increase revenue. Below are a few of the most important benefits of our SEO services for manufacturers or dealers of farm and agriculture equipment. As the leading provider of SEO for farm equipment and agriculture equipment dealers, we know your customers and the keywords your target customers are most likely to use when looking for your services and products. Our proprietary keyword analysis process guarantees you improved rankings on Google, Bing, and Yahoo, and determines which search engine holds the most value for your brand. Our Audit and Competitive Analysis also reveals important information on the condition and effectiveness of your landing pages, ensuring that users actually convert into customers after ‘landing’ there from an organic or from a paid ad on Google AdWords or Bing Ads. This raises your campaign’s conversion rate while lowering cost-per-click (CPC). At Russell’s Group, our mission is to work with your firm to create pages optimized with relevant and compelling information, delivered in such a way that gives your audience everything they need to know about your brand, your products, and services, increasing the likelihood of turning them into customers. Russell’s Group’s SEO for Farm Equipment and Agriculture Equipment dealers is built with one goal in mind: to increase sales and profits. Our proprietary suite of SEO techniques and tools are designed to generate leads, convert these leads into sales, and turn these customers into repeat clients. As a Certified Bing Ads Partner, Russell’s Group specializes in building Big PPC Campaigns with high returns. Your farm and agriculture equipment company can reap the benefits of search engine optimization now. Let Russell’s Group help you by building an SEO campaign specifically designed to market farm and agriculture equipment and machines. Call us at (502) 222-8099 to learn more about how our SEO services can help you.